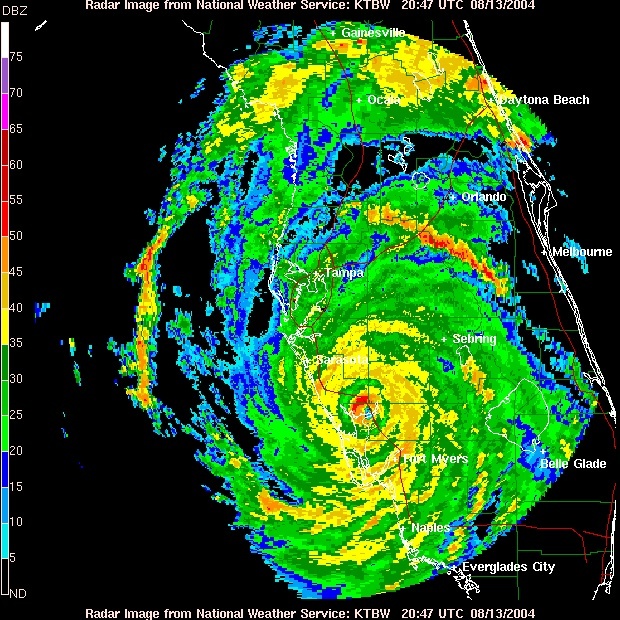 Now that the Atlantic hurricane season is officially kicked off, I remember the only hurricane I ever first-hand experienced, and will remember for the rest of my life – Hurricane Charlie, a decade ago while visiting my parents in Florida. The following day, I heard a word for the first time, apparently a common term, and thought the term “brackish” was funny, simply an odd sounding word. I chuckled at the time only because I did not live there, living a fantasy as a tourist before traveling back to my reality. Coastal reality means running that risk, far off into the blue on blue horizon of possible future cyclone formations. Also, a coastal reality is brackish water. When a storm surge moves onto land, which can be the greatest threat of a hurricane, sea water spills into fresh water. The result…the salt wins every time. This is how we saw Charlie on tv, nearly directly overhead. Less than a mile from the coast made all the difference between evacuating and staying. The idea was for a drink to appear murky, which may not look appetizing when faced with it, understandably. I wanted agricole as the backbone, a French-styled rhum. With so many ingredients, I did not want strong flavors to ruin the delicate combinations, rather using small portions. Some of the ingredients are strictly for visual effect – color and translucency, just as some for aroma. How it looks, how it smells, how it tastes, even how it feels – these are what all drinks are meant to do inside their glass. For example: Yellow grapefruit both colors and tastes differently than the pink variety. I prefer yellow regardless. However, in this drink, appearance is more important, as the pink would alter the color out of desire’s control. 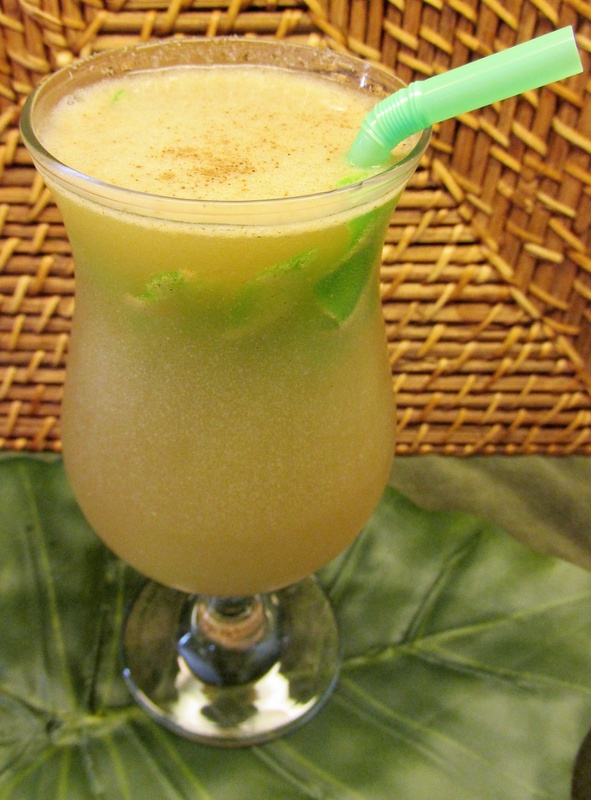 Also, aside from their sweetness, the Chambord and melon liqueur present a graying property. Agricole, citrus, sweetness, and spice; light and cool; although light-hearted, I mixed the recipe in hopes of depth. I almost bought dried seaweed at the grocery store for the garnish of this drink, but thought the aquarium kind would look more playful. In fact, the original idea was for real seaweed half in/half out, maybe even keeping it dry outside the liquid. So please do not go out and buy a small, plastic, aquarium seaweed just for this drink, relying instead on something you can use for other purposes as well, whether rolling your own sushi, or adding to a tasty soup to make you more healthy. Careful: That is not water you scooped out of the ditch. First, rub back half of chilled hurricane glass with spent lime shell (I used a poco grande glass), sprinkle with sea salt, and jostle glass of excess. Place clean aquarium seaweed on bottom of the glass or if using real seaweed, dip in when completed). Shake ingredients vigorously with ice for twenty seconds, and double-strain into glass. Lightly sprinkle allspice on top, but not much. *Pepper syrup: Making more than I needed for one drink, in a small sauce pan, on medium heat, warm 1/2 cup of water and 1/2 cup of sugar with 1 tablespoon of cracked black pepper. Simmer for a couple of minutes without boiling. Take off heat and allow cool to room temperature. Stain a couple times with fine mesh strainer. **Cure-all Mix: Simmer 3 tablespoons of water with 3 tablespoons of local honey with a cinnamon stick for a couple minutes. Take off heat and allow to cool to room temperature. I prefer a cinnamon stick to cinnamon powder, yet not dead-set against powder, just as long as only using a teaspoon for this amount of honey, and then straining twice. I call it a cure-all because of how much the combination of locally grown honey and cinnamon can do for your health, particularly when suffering from allergies. This entry was posted in Brackish Water and tagged brackish water, Hurricane Charlie by Jack. Bookmark the permalink. That drink looks so interesting! and the picture is beautiful. But what is aquarium seaweed? i have a fish tank but have never heard of it. Sorry. I did not use the right words. I meant to say what you are asking – simply the plastic plant-life you would use for your fish tank, coming in an array of sizes, shapes and colors. Thank you so much for the compliment.